It was a strange plan as we were going to start together with the other 100 anglers a the launch but then we were going to split up and fish miles away from each other. A decision that would bring very different results for two hopeful anglers. My plan was to go to the only turf I knew in the area and hope that a little knowledge could bring me over the top during what had been tough fishing conditions. picked it up at the Backpacker in Baton Rouge. Sorry about my thumb but it was a pretty day. If you look carefully you can see the ripples of a big red on the line. My day began with a significant paddle to my first fishing spot. I can tell you I was a little nervous watching one of the greatest names in South Louisiana fishing going down the bayou in front of me. Choupique as he's known in kayaking circles has wracked up an impressive string of tournament victories but he turned left when I turned right whew! So I settled in my spot as the sun came up and it wasn't long before I started seeing reds. Big reds. How big? The first fish I cast at I threw at him three times before I hooked up. I normally throw about 30" in front of the tail well when I got him close to the boat this fish was snagged in the dorsal fin about 6 inches behind his head! After about 20 minutes of being drug around I was ablle to shake him loose. A few more fish in this area were clearly the same size and clearly not interested in my baits (picture of lures can be seen here). So I moved into the marsh. 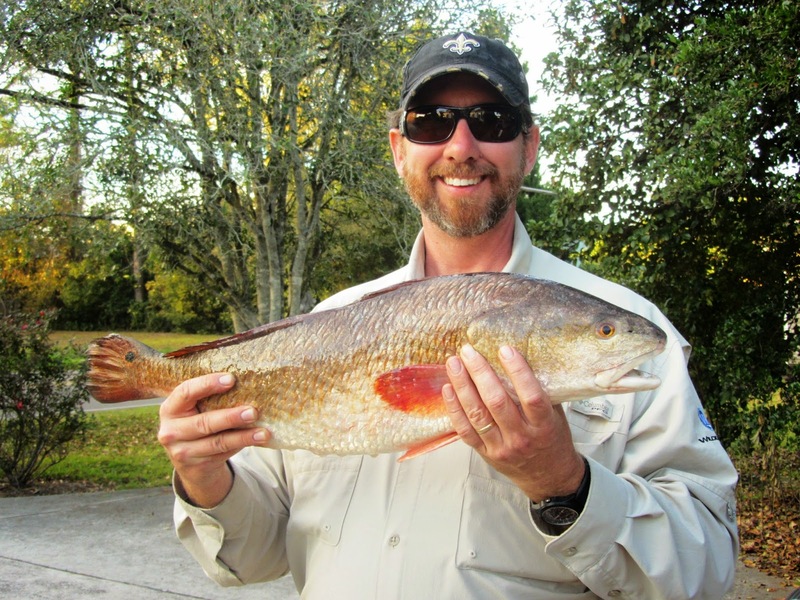 It's counter intuitive to look for fish in shallow water when its cold but that's where the redfish will often be. Wish I had taken a picture but if you imagined an area about the size of your living room that's where my first action would take place or inaction. I come around a bend into a favorite spot and stand up. There's a school of reds. I mean like 9 of them in 18" of water. Now water refraction is a funny thing these reds looked about 24" but would turn out to be different but nearly 10 (felt like 20) casts later nothing. I mean I ran the bait by their nose I ran it over their backs. It didn't spook them nor did it interest them. I changed colors three times and threw a topwater. Nothing. It was as if my lures were invisible. I actually sat down to leave once then I changed color one more time and I thought, "OK only thing left is to deadstick them". This is when you toss a bait and just let it sit maybe wiggle it a little (can't help but think of the guy from PaddlePalooza - if you know you know). So I throw the electric chicken lure and simply wiggle it a little and watch as a fish inhaled it! Whoahhh nelly. That little fish turned out to be a beast. At this point I'm running out of time and energy just can't go on (or lift the fish into the photo but what a great day). So I didn't take pictures of them all but on the day I caught 11 fish. 2 over 27 inches and 7 over 30 inches only two would fall under 27. Oh yeah that brings me back to the 27 inch red. 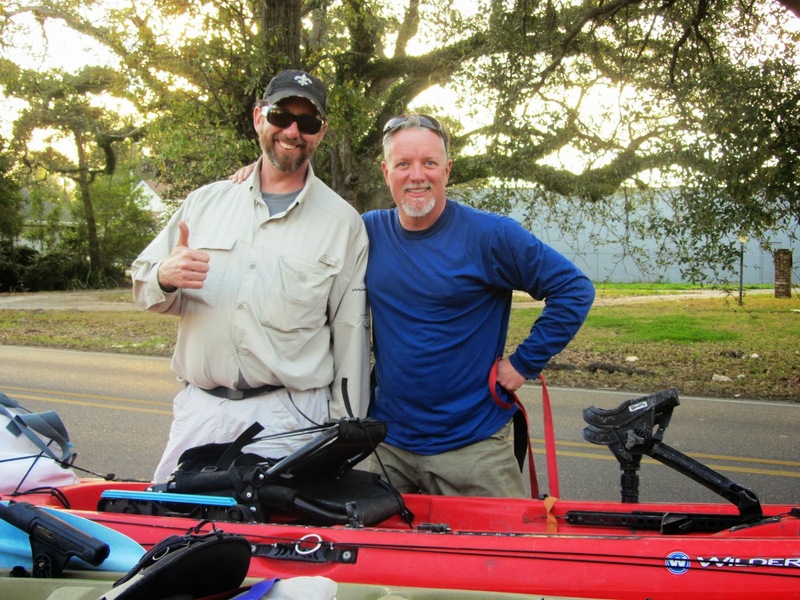 Two things about fishing tournaments - it's hard work and victory often goes to the wise. Fish shrink (that's why should keep borderline fish you could hit the dock and have a short fish). So anyway I remeasured that fish around 2pm and it was under 27 inches and I knew it was probably my biggest slot red ever (previous best 7.9 inches won big fish a few years back at another tourney). So I start my paddle in - cut it a lot closer than I meant to - got into line with 7 minutes to spare - see a monster red in front of me - whew it's too big - another one whew its too big - pull mine out - a few gasps - a "is that legal" - yeah man that's legal - 26.5 inches was the official length and the weight 8.55lbs. Yes there was a fist pump. I knew I'd made a personal best if nothing else. That could not be taken away. I had gone big and there was no doubt about it. 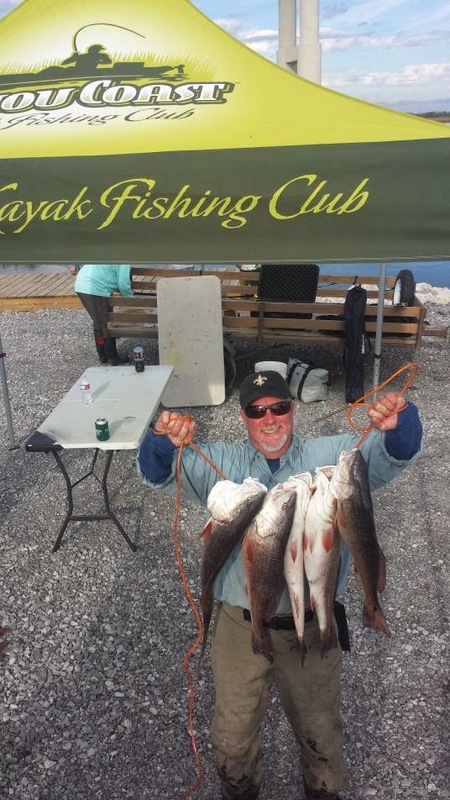 And I didn't have to go home a loser when came the word: I had won the Cabelas Big Fish prize at Minimalist Challenge 2015 It was a nice haul too. I made connections with some new friends, some old friends, put real names and handshakes to some internet acquaintances met a fellow Presbyterian and another Clergy had a challenging day and still brought home some serious swag. Lord thank you for all of it! O and I almost forgot the fishing buddy who went the other direction? 2nd Place with a full limit of reds - awesome job buddy! I did place 10th out of 100 - with two fish! Nice job, Rev. I had to work (again) for this tournament. (district honor band concert in Hammond). I'm off in the morning (MLK) and will either fish Bayou Beinvenue or Bason's. I'll let you know how I do if I go to Bason's, as I know that's your stomping grounds. Congrats on big fish. I need to follow you with my fly rod next time. I really think the challenges we faced with normal tackle may have actually favored a fly fisherman today. Some of the fish I intentionally passed up would likely be lifetime fish for fly anglers. I just didn't want to fight them during a tournament. I knew these fish would take 20 minutes or more to land. This t-ment sounds like a lot of fun. 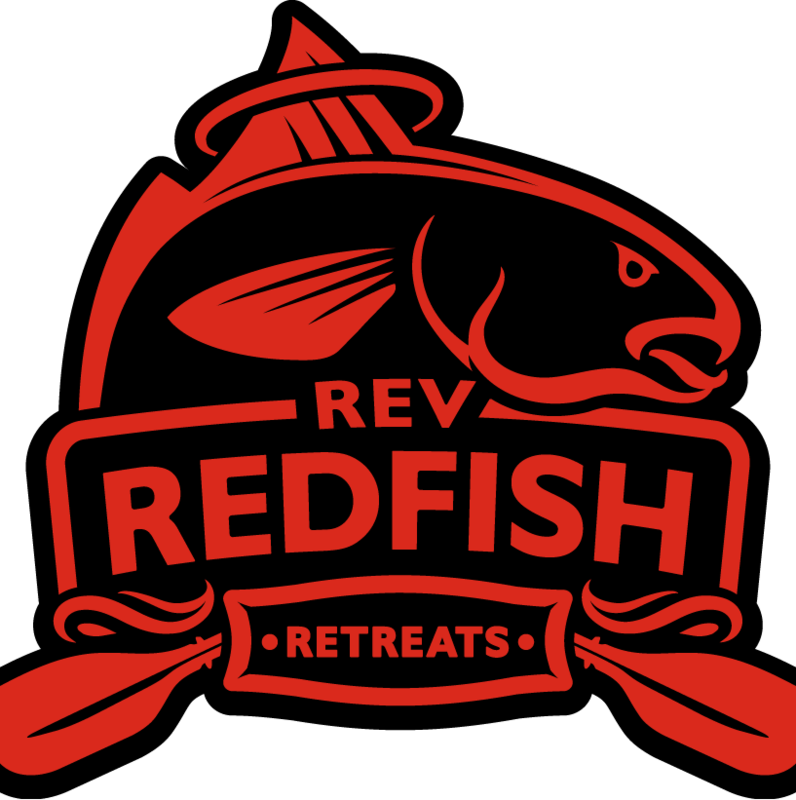 Great report as always Rev! !